Starting on January 1st 2015 Steven Abraham commenced an attempt to beat Tommy Godwin’s record set in 1939. 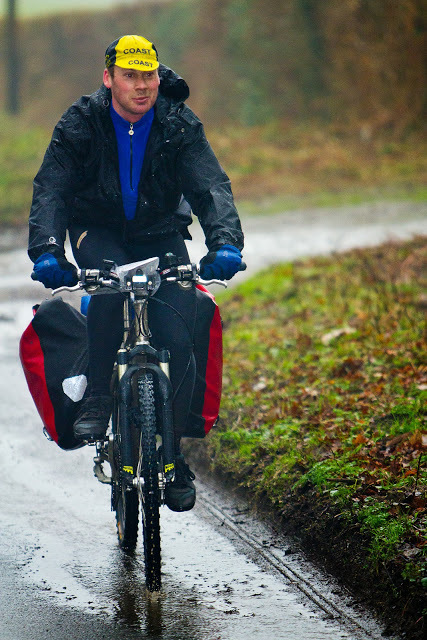 He has to cycle more than 75,065 miles in 365 days. That is an average of over 205 miles a day, every day, for a year. Or 8.57mph, for every single hour of the year. It captivated and almost scared me when I first heard about it during a CTC (Cycle Touring Club) club ride when I was 15 years old. I didn’t know who Tommy Godwin was, or who had done this incredible world record ride at the time, but I became fascinated by it and started to wonder if I could do it myself one day. As I completed more and more long distance endurance events over the years, and reviewed my performances in them, I began to realize that maybe it was realistically within my capabilities. Where does it rank in terms of cycling challenges? How difficult is it? I would say it’s very, very difficult – for many reasons – both physical and psychological. I will let your readers decide where it ranks for them, but for me it obviously is the ultimate long distance cycling challenge (which is why I have made the sacrifices I’ve made in order to have a go at breaking this record). It has fascinated me for many years now. Success in this challenge is not just about fitness or determination, it’s also about some luck and good fortune. I have to avoid illness, injury and incidents in order to get through this. It’s like facing all the pitfalls life can throw at you and finding your way around them. The number of variables my team and I are dealing with is almost mind boggling. Have you done big high-mileage cycling challenges in the past? I normally do Audax long distance cycling, solo cycle touring and 24 hour time trial races – all year round. I have done all the toughest and longest Audax long distance cycling events in the UK – and some abroad. That includes numerous multi-day rides (called randonnees) which often require you to ride similar daily distances to what I am currently doing, within specified time limits (the Audax UK website is a great place to learn more about these). The difference now is that it never stops. I have to do the rides every single day, without fail. If I miss a day I will fall 200 miles behind the planned schedule and I will have to continue putting in average days of 200 miles riding distance, whilst also catching up on the day lost! So far I have not missed any riding days and have actually done some days much longer than scheduled. Let’s hope it remains this way – fingers crossed! How do you think the challenge compares today as to when Tommy Godwin did it in 1939? Different conditions, different traffic and different support, I think he had a lot of support, he probably had more than I do. There are similarities, I’m competing against someone from abroad, as Tommy was and he was behind at the start, but went on to lead and I’m behind Kurt at the moment. (Kurt “Tarzan” Searvogel is an American cyclist attempting to beat Tommy this year as well). What was your preparation for this challenge? I have done Audax long distance cycling (and regular 24 hour time trials) for many years now. My last two years in particular were aimed at readying myself for this challenge, by testing equipment and riding/sleeping strategies. I first started doing 100 mile rides with my Dad, well before my teens. What inspires you each morning to get back in the saddle? It is just daily routine; it is not about being inspired, it is just what I am doing. Any thoughts on taking on the 100,000 mile record? Yes, if it looks like we can do it and I’ve got the support and I can do it I’ll have a go at that. (After finishing the one year record in 1939 Tommy continued to ride and reached the 100,000 mile distance quicker than any other person has managed). I get up around 4am at the moment. I shower when I wake up (because I’m too tired to clean myself up when I get back from an all-day ride). 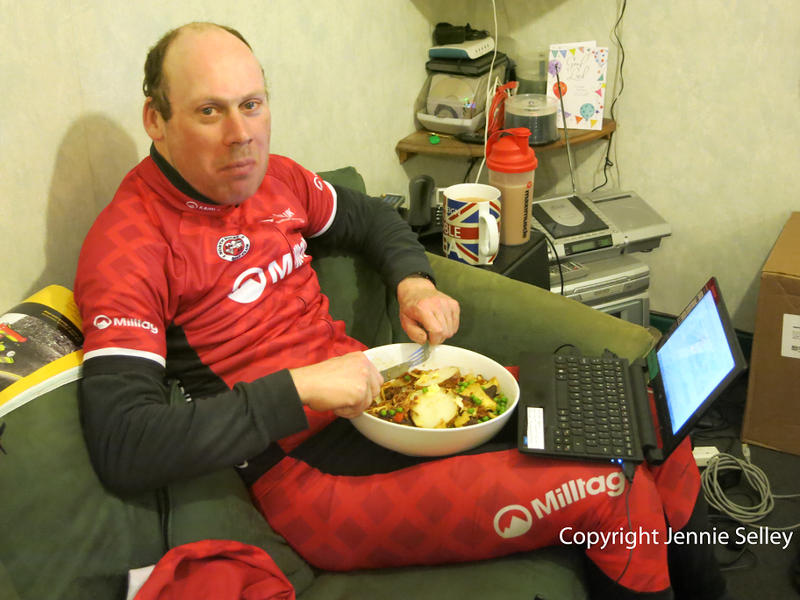 I then eat and prepare my riding routes (I have a friend called Andrew Morris who makes the routes for me, but I sometimes need to alter them on the day, or load them into my Garmin GPS guidance and recording devices). I have 3 devices for backup, to avoid losing a recording due to a mistake with my settings, a freak equipment failure, or a drained battery, etc. I try to get onto the road by 5am if I can and am usually quite tired after getting out of bed in the mornings. But I do wake up without the alarm having to go off and my crew chief Chris Hopkinson calls at 5am to check I am out of bed and riding (or he checks the tracker on my website to see that I have been moving). I ride all day in various areas and various terrains – sometimes with supporters beside me but usually alone. I am enjoying the time on the road – I love cycling – and now that the initial anxiety of starting is beginning to lift I am appreciating the opportunity more and more and enjoying the rides more and more. I have developed a raging appetite that rears its head after every 50-miles of riding. This is not usual for me, but I think weeks of non stop riding are taking their toll. I am losing more than a kilo each week in weight – at the moment – despite doing my best to stuff myself with food all day long! I weighed 75kg when I started riding and I am now at 70kg (weighs himself as we are speaking to confirm). When I get home – or reach my host for the evening (my team has recruited a network of hosts around the country who put me up for the night whenever I travel away from Milton Keynes) I will eat first. Then I will spend the next hour or so preparing my bikes for the next day’s ride, checking my routes and charging my equipment. I must submit each day’s ride to the adjudicators at the Ultramarathon Cycling Association (UMCA) – and that’s one of my most important tasks at the end of each ride (or the day of riding will not count!). This is also the time I will do any media interviews I have had lined up by Idai Makaya from my team. I usually do 2-3 interviews each week. Sometimes I arrive late at my destination and miss appointments and interviews. I am often completely exhausted at this point and just struggle my way through the one to two hours after each ride in a tired haze, simply doing what I am told to do, going where I am told to go, and then making sure I’m in bed as quickly as possible! Then when I get up I start the whole cycle again! Don’t get me wrong, I am enjoying this. But it is also very challenging. How much are you eating, sleeping, resting? I try to sleep as much as I can but the schedule determines how much sleep I ultimately get. At this point in the year I am aiming to put in 170-mile days, tracking slightly ahead of what Tommy Godwin did on each calendar day. On 3 days this year I rode more than 200 miles each day. On days when I have gone over 220-miles I’ve had to make do with 3-6 hours sleep because my fitness is still developing and my pace is really slow at this stage of the ride. I am happy to get 8 hours sleep each day on other days – but in the summer I may only get 4-6 hours, because that is when I will be striving to reach consecutive 300 mile days. A schedule of my mileage plan for the record can be seen on my website. What route are you following? The same every day? I have a friend called Andrew Morris who is making my routes for me, to save me time and also to keep my rides interesting and varied. Another important role he plays is to coordinate my rides to match the wind direction and weather, avoiding snow and ice, finding cross winds and tail winds, that sort of thing. It makes a tremendous difference to my pace and distance each day. I also have a Garmin 1000 device which can act as a satnav and take me to places if I’m having difficulty. What average speed are you trying to hit? Are you cycling on flat only? I’m trying to keep it as flat as is practical, so I’m not looking for any hill challenges! I am riding according to heart rate, aiming to average no more than 110 beats per minute. I often average as little as 80 beats per minute on an all day ride, so I am really pacing myself conservatively at the moment and allowing my body to adapt and strengthen up. My heart rate tracks my effort level and that effort level determines my pace. As I get fitter the same effort will produce faster speeds. I seem to be averaging about 16 mph (rolling speed) currently (12 mph overall/average pace – including stops). I expect to become faster over the months. Weather conditions also play a big role and the summer is likely to provide the best conditions for faster, longer daily rides. Are you optimistic of beating Godwin’s record? I am, otherwise I would not be doing this. However, I don’t take it as a given. It’s not something definite. It’s not going to be a simple procession. Everyone who attempts something like this – including Tommy Godwin himself when he did it – needs to put in a lot of hard work, a lot of determination – and a bit of luck too. I really do my best not to worry – and the guys in my support team do their best to hide things from me that may otherwise cause me to worry! I am going to be living in a bubble for a whole year! Were there fears you had in the beginning that have been disproved? Any that have proven valid? No, I wasn’t really scared of anything; you just have a go, don’t ya? Has anything bad happened so far? I fell in the ice early in the third week of the challenge, when the rider accompanying me on that day slipped just ahead on a winding country road. I got through the incident unhurt, just slightly bruised, but the other rider broke his hip. I’m really saddened by this and I feel so bad for him. All he could think of after the fall was that he didn’t want to be the guy to end the world record challenge for me! I really appreciate the help I have received from my cycling friends – and from complete strangers as well. I could not have done this without them and their support (moral, physical and financial). I also could not have done this without the equipment, resources and funding from all my sponsors. What do you intend to do when you are finished? Touring, I want to go on tour and stop at all the cafes I’ve been passing and say thanks to everyone. What do you see yourself ten years from now ? I don’t know, touring, if I can go touring for the next ten years I’d be happy. What are your cycling influences, who or what got you interested in cycling? My dad I suppose, a mate from school, the people at CTC Herts DA. What bike are you riding? Any modifications? How much does it weigh? ◾Raleigh sponsored me with 3 of their standard Raleigh Sojourn steel touring bikes. They weigh 26 lbs normally – and when fully loaded for a day’s ride, about 30 lbs (we just weighed the bike now as we addressed this question). ◾I modified them each with tri bars (to help distribute the weight of my body more evenly and stress my backside less). ◾3 Garmin GPS devices for recording and navigational backup (if I fail to record a daily ride it’s a wasted day of riding). ◾A bike rack pack from Carridice. ◾Special tubeless tyres from Schwalbe that self-repair if they puncture and save me lots of riding time. The 10 minutes required to fix a punctured tyre could cost me 3 miles of riding, and I seem to get punctures every one to two days on a big riding day. So I am saving what could add up to a thousand miles of riding by using tubeless tyres. ◾I also have special Brooks saddles for added comfort on each of my 3 identical bikes being used for the world record. ◾My main sponsor for the challenge, Chain Reaction Cycles, gave me the opportunity to shop their website for all the wear and tear items I will need throughout the year – and I changed my bike headsets and bottom brackets to the most durable ones on the market as part of that £2,400 shopping spree (Chain Reaction Cycles also pledged a large amount of cash to help cover some of my ongoing expenses). Otherwise, my Raleigh touring bikes are pretty much off the shelf (in keeping with what Tommy Godwin did in his time – also on bikes provided to him by Raleigh). How did you come to your current bike set-up, is steel the best bike for this type of riding? Yes, I think so, I’ve heard of titanium frame breaking, carbon fibre is good, but you have to watch the carbon forks with aluminium steerers as they go and aluminium doesn’t last very long. Steel has been used for years now and is more reliable. Do you plan to ride the same amount every day, or change it depending on how you are feeling? I plan to lengthen my rides as they daylight hours lengthen, which will give my body time to adapt to the mileage. So I will be aiming for about 170-miles per day in winter and taking it up as high as 300 miles per day in mid-summer. I will then hope to taper the distances downwards again going into the next winter. A schedule of my mileage plan can be seen on my website. Keeping yourself going both on and off the bike is important, what tips do you have on nutrition? Just eat what you want to eat, when you want to eat something you want to eat for a reason I reckon, just listen to your body. What’s been your best moment on the bike so far? I don’t know, I’ve had loads of good ones, cycling when the sun comes up. It was a good one today, going into the sunset. I’ve had quite a lot of that sort of thing. I’ve had a lot of good days. What are your thoughts on drug use in professional cycling? It has been going on ever since it started; it is just how it has been as far as I know. Graeme Obree refused to go professional on the road because of the drug use. He got the hour record and got on the professional road race scene and all the pros were coming up to him asking what he used to get the record. When he realised what they meant it put him off turning pro as a road racer. All photos used are copyright of Steve Abraham.